Making and maintaining correct robots.txt files can sometimes be difficult. While most sites have it easy (tip: they often don't even need a robots.txt file! ), finding the directives within a large robots.txt file that are or were blocking individual URLs can be quite tricky. 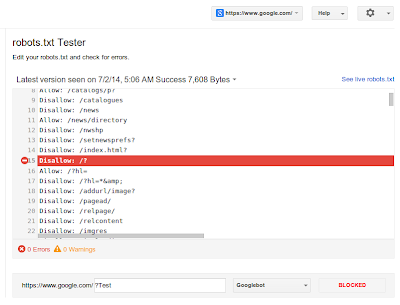 To make that easier, we're now announcing an updated robots.txt testing tool in Webmaster Tools. Here you'll see the current robots.txt file, and can test new URLs to see whether they're disallowed for crawling. To guide your way through complicated directives, it will highlight the specific one that led to the final decision. You can make changes in the file and test those too, you'll just need to upload the new version of the file to your server afterwards to make the changes take effect. Our developers site has more about robots.txt directives and how the files are processed. Additionally, you'll be able to review older versions of your robots.txt file, and see when access issues block us from crawling. For example, if Googlebot sees a 500 server error for the robots.txt file, we'll generally pause further crawling of the website. 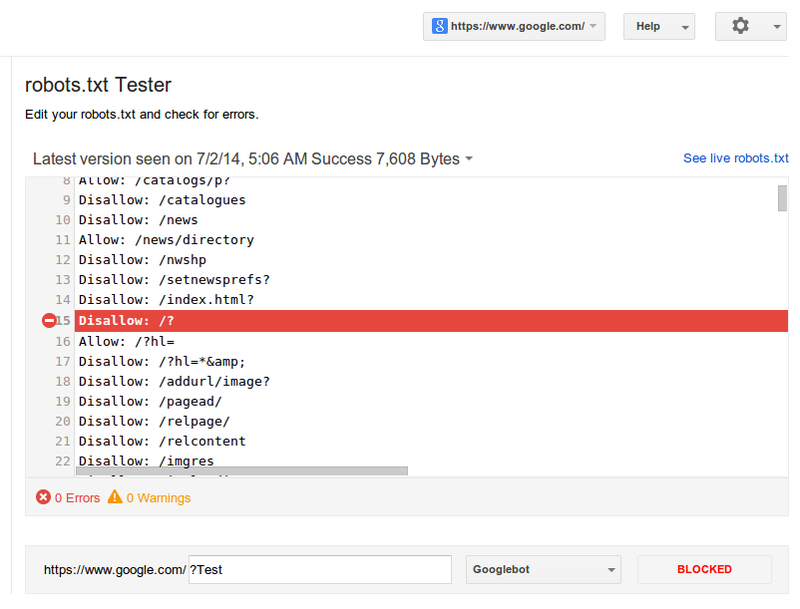 We hope this updated tool makes it easier for you to test & maintain the robots.txt file. Should you have any questions, or need help with crafting a good set of directives, feel free to drop by our webmaster's help forum! A common annoyance for web users is when websites require browser technologies that are not supported by their device. When users access such pages, they may see nothing but a blank space or miss out a large portion of the page's contents. Web Fundamentals: a curated source for modern best practices. Web Starter Kit: a starter framework supporting the Web Fundamentals best practices out of the box. rel-alternate-hreflang. If you haven't, in short, this annotation enables Google and other search engines to serve the correct language or regional version of pages to searchers, which can lead to increased user satisfaction. Making sure the deployed annotations are usable by search engines can be rather difficult, especially on sites with many pages, and site owners all around the world haven’t been shy telling us about this. Today we're releasing a feature that should make debugging rel-alternate-hreflang annotations much easier. For each error of this kind we report where and when we detected them, as well as where the return link is expected to be. In case our indexing systems detect language or country codes that are not in these formats, we provide example URLs to help you fix them. Additionally, we've moved the geographic targeting setting to this part of Webmaster Tools, so that you can find all information relevant to international and multilingual targeting in the same place. We hope you'll find this new feature useful and that it helps you to identify issues with the rel-hreflang-implementation on your site. If you have comments or questions about the feature, please post in our Webmaster Help Forum. If you are targeting users in more than one country, chances are you already heard about rel-alternate-hreflang. If you haven't, in short, this annotation enables Google and other search engines to serve the correct language or regional version of pages to searchers, which can lead to increased user satisfaction.